Mark sent me this goldmine. I think this is definitely a car repair place you can "trust." 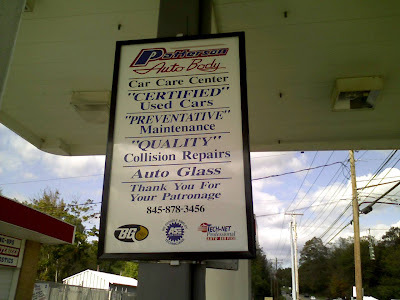 With all those other words in question, can you even trust the auto glass than ISN'T in quotes? OK, peeve: "Preventative" is a noun, as in, "Vitamin C is a preventative". "Preventive" is an adverb and what they meant to put here, as in "preventive maintenance". They don't know how to use quotes, either. Ack! And they used "preventative" instead of "preventive"... PREVENTATIVE ISN'T A WORD!!! I think these people are not caucasian they are not literate? That's pretty darned offensive, Sharonhps, especially given the literary quality of your comment. I don't know what to assume about you from your lack of punctuation and incredibly stilted sentence structure, but I certainly wouldn't assume that you're not caucasian based on it.